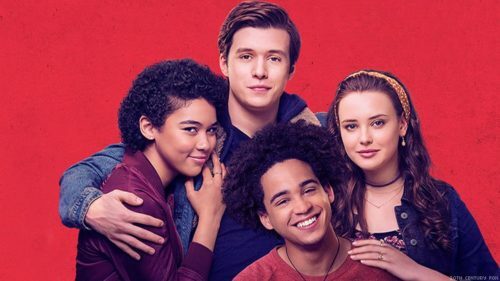 My dearest Gentle Reader, I finally went to see Love, Simon and I have a few thoughts. I don’t wanna get into a debate or impinge on anyone’s feelings about this movie (you are utterly entitled to your own opinion and should not be influenced by mine). Please note that in my (home) blog post I will not approve comments that are spoilers or crack open said debate, use your own platform for that, please. 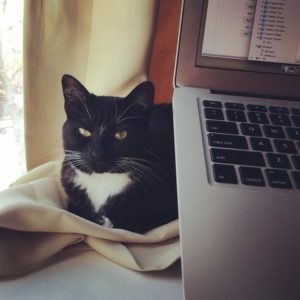 So, if you haven’t seen it or you really adored it, then you might want to skip to the bottom of this blog post, Other Options, for more movie recs. I don’t go to movies often, it’s hard to make time, but I really wanted to support this one so I managed to make it to a matinee showing on the very last day available in my area. Apparently I’m not alone in wanting to show support. I was, however, alone in the theater. Couldn’t have asked for a better viewing. I had really high expectations. I agree with general concerns over the sanitized nature of this movie. However, the very clean prettiness of the presentation made it feel retro to me, like something vaguely John Hughes. My point is, something bright and shiny and sweet (and yes, sanitized) slides in under the radar. It will be shown in theaters across the country and not just in arthouses in major cities. In that, I give Love, Simon props. It’s fighting, just not with knives. 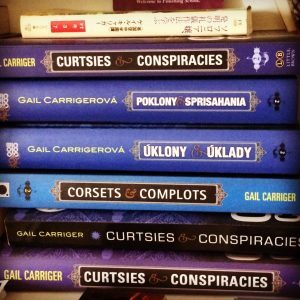 See Gail talk about the power and subversive nature of comedy in this blog post. I found it super cringe-worthy at points. I wanted desperately to fast forward several parts, instead I ended up just covering my face with my hands. 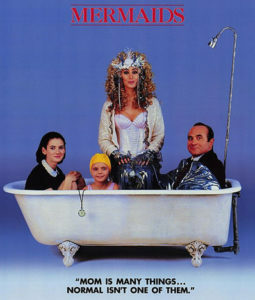 I don’t like to be embarrassed for the characters on the screen, I still flinch when I even think about the film Mermaids. So this kind of thing makes me particularly uncomfortable. The dialogue was not as snappy or witty as I’d hoped. I wanted something a little more like Mean Girls, 10 Things I Hate About You, Bend it Like Beckham, Clueless, or even She’s the Man (only, you know, GAY). 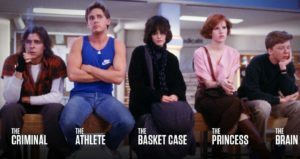 In terms of writing, I’d even have settled for something more classic old school poignant-meets-cheese like Breakfast Club. The dialogue in Love, Simon was, well, fine. Dull. Not quotable, but, you know, there, I guess? My biggest issue is kind of a spoiler but I think I can be euphemistic enough to articulate in a way that only those who’ve seen in the movie will understand. It has to do with the ferris wheel at the end. I was a pretty upset to see Simon do unto Blue basically what Martin just did to Simon. He took away Blue’s agency in a pivotal life choice. It was social pressure, meant nicely, but still social pressure. While the nature of intent is open to debate, Simion essentially forces choice onto another. Blue should have had the option to make his choice in his own time without the empathy-pressure of Simon’s immanent humiliation hanging over Blue’s personal decision. Sweet and romantic as I found Simon’s grand sappy gesture, that part really messed with my head. I don’t know if I’ll be able to forgive the movie for it. In the end, I did enjoy it. I found it sweet and the characters were likable, and the romance was satisfying but that last plot point was a doozy. I understand Love, Simon’s importance to the zeitgeist. I do. Tumblr alone has opened my eyes quite a bit. Update: 8.14.18 ~ I Read The Book! I finally picked up and read Simon vs. the Homo Sapiens Agenda. Which I very much enjoyed. All of my concerns and reservations and issues with the movie do not exist in the book, so HOORAY! I will still die on the alter of The Geography Club or Boy Meets Boy, as I like both of those slightly better, but it’s a good book. Very enjoyable. If you like the movie I think you will probably LIKE THE BOOK MRE. So go read it, m’kay? If you liked Love, Simon you might also enjoy these. Or if you had some of the concerns I did with that movie, you might prefer these. 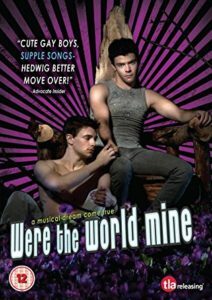 Were the World Mine ~ Streaming right now on Prime, this is the only movie I know (off the top of my head) that’s also a gay romance set in high school. However, I wouldn’t call it a comedy. It’s a slightly surreal romantic drama musical.Some consent issues – Shakespeare’s fault. To me, it feels like it owes more to a more cerebral movie like Flirting, than anything else. Bonus glitter… lots of glitter. The Geography Club ~ Slightly more honest to its book than Love, Simon, this one is more about self discovery and friendship than romance. Inf act it’s isn’t a romance at all. It has a jock focus and since I happen to love American football, I like that part. 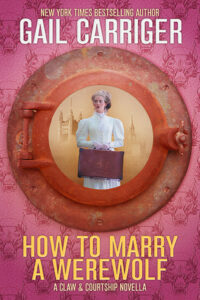 If you’re warm squishes are about found family rather than first kisses, than this is for you. One of the reasons that Love, Simon is so important is that it’s a high school set romantic comedy with gay characters. And I get that, I do. It’s a favorite setting of mine, obviously. But here are some movies that tackle some similar themes in a slightly more adult setting. Shelter ~ Just post high school this features adorable surfer dudes, familial responsibility, honor, duty, and painful coming out. 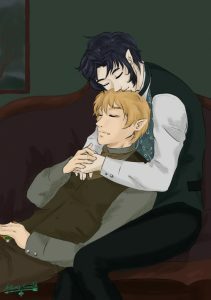 Bonus points from one of my favorite romance tropes: finding love with the brother of the best friend. 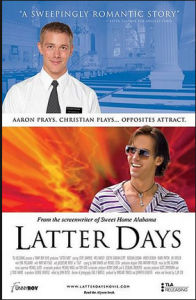 Latter Days ~ One of my favorite all times movies. I features: a repressed Mormon, dramatic indie songs, unfair mistreatment by the ignorant, reformed bad boy, with bonus Tara from Buffy. The scene when he drops the tray. I mean, come ON. So good. 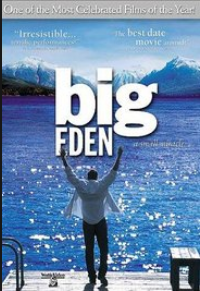 Big Eden ~ This feels like a real romance. Yes there are quirky characters, but they’re so much more honest than Hollywood usually allows in terms of complexity, appearance, vocabulary, everything. Bonus cooking = love! I have a blog post all about Queer Romantic Comedy Movies that includes these movies plus lesbian and trans romantic comedies. 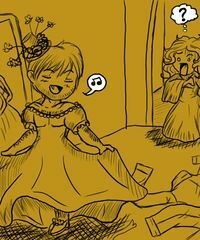 Check it you if you want some ladies in your gay. 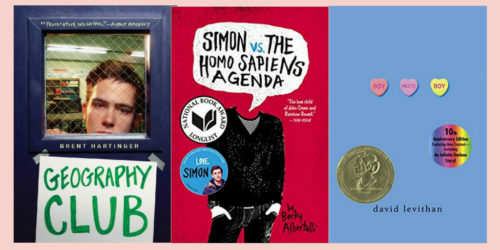 Like the book, Simon vs. the Homo Sapiens Agenda? Mermaids was pretty awkward, haha! I am actually feeling this way about the book. It’s just not hitting me the way it did so many others. My pleasure, thank you for taking the time to do a real review. It’s really wonderful that you do! My comment will be the most pedestrian among literary people, but the book was better. There were far more snappy retorts, and funny exchanges that didn’t make it into the film. Your concern on the final plot point (which I share by the way – everyone watching him ride was painful) was avoided in the book. That being said, the film has opened a lot of dialogue with my students. A number of my kids saw me reading it during reading time and wanted to chat about it, and seemed interested to read it once I was done. So for that purpose the film helped a lot. I’m getting the impression I really must read the book. And I’m DELIGHTED to hear about your students. I’m so glad you listed “Boy Meets Boy” by David Levithan and Were the World Mine. Both made me happy cry with how unapologetically happy they showed queer characters. One question I always had about The Finishing School series is why you didn’t have any specifically queer characters mentioned other than Vieve? Was that because of the target audience? 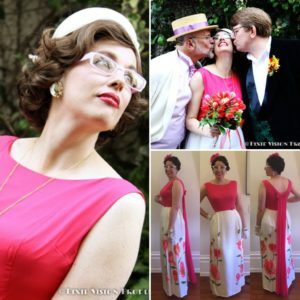 Or maybe a character’s queerness never came up? 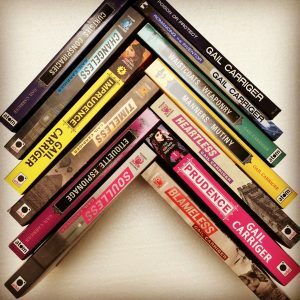 Would you ever do a YA novel with queer characters? Sorry. I was catching up on your blog and had all these thoughts. 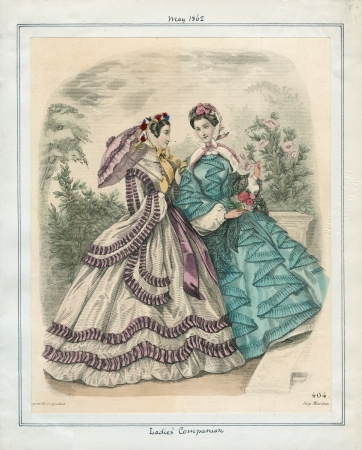 Mademoiselle Geraldine’s and/or Bunson seemed rife for queerness, though maybe too expected? Have you seen Handsome Devil? Another sweet gay high school story. Some cringeworthy/embarrassing moments, but they are addressed as such. Overall a sweet movie. I saw this with my daughter, who is fifteen, partly because I wanted to see it, and partly because she couldn’t possibly see it with her mother (my ex-wife). 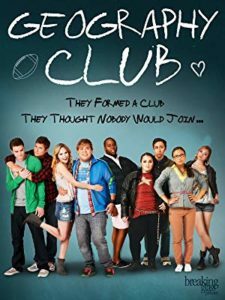 Not being aware of the story other than having seen the preview, I thought it was a pretty good way to do just what Gail has suggested, normalizing queer relationships at a high school level. As the father of a recently out child, I was exceptionally happy that my daughter was so happy to see this movie. It has helped her to feel “normal”, and she came out to her mother and step-father shortly after seeing it. So, that’s a pretty good result, in my book.